Did you know that when you feel judged by others, it stimulates feelings of very real social pain? Pioneering neuroimaging studies by Matthew Lieberman at UCLA show that social pain and physical pain share the same underlying processing system in the brain. It can literally feel painful to facilitate, present or speaking when we’re being socially appraised and judged. Whether you’re a full-time facilitator, a contributor running a meeting or a leader speaking to a crowd, it’s critical to understand this wiring in your brain and learn strategies to overcome it. Here are five strategies to defeat the sabotaging effects of social pain. Shift from crisis to opportunity. Your brain is wired to view a situation where you’re being socially appraised (e.g., speaking in front of a group) as a crisis. You might start having thoughts like “I’m losing this audience” or “I didn’t prepare well enough.” When we start seeing a situation as a crisis, noradrenaline is released into our bloodstream, reducing oxygen flow to our brain and making it hard to think clearly and speak articulately. This response further stimulates the feelings of social pain, meaning we will look even more anxious and less confident. 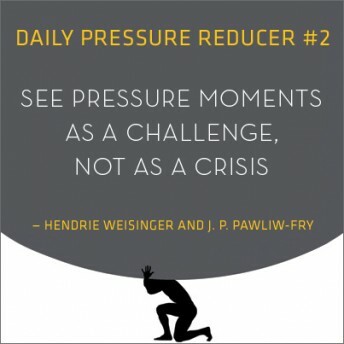 When we see pressure moments as opportunities, adrenaline is released into our bloodstream, improving the oxygen flow to our brain and minimizing the social pain we feel. This response allows us to use our best cognitive ability and show up with greater positive affect, giving us more influence with people. Often, we overstate the importance of a situation: “This is the most important presentation I’ve ever had to give” or “It will be a disaster if I don’t nail this facilitation.” The more important we see a situation, the more social pain we feel, leading to distorted thinking, errors, lack of focus and less skillful behaviors. Social psychologist Amy Cuddy and her research team at Harvard discovered a connection between our body posture and our confidence. When we are in a “closed and contracted” position—shoulders forward, slumping, arms crossed, typing on a phone or computer—the hormones that regulate stress and feelings of confidence move in the wrong direction (i.e., stress goes up, and confidence goes down). When we are in an “open and expansive” positon—sitting straight or standing with our shoulders back and arms open—the opposite happens: We begin to feel less anxious and more confident. Prior to your facilitation or any time you feel social pain, make sure you’re not sitting in a closed position. If you can, stand up prior to your presentation. If you have to sit down, keep your shoulders back, head up and palms turned up. It will actually increase your confidence! Recall you at your best. Science has shown that by visualizing your past successes in similar situations, you stimulate the same types of responses that helped you before. Research shows that the thoughts and behaviors associated with past experiences are imprinted on our brain. The more frequently these experiences are remembered, the more firmly implanted they become, and the more likely they are to resurface in a current experience. Prior to or during a presentation, think of a time when you gave a powerful speech, and remember how that felt. If you haven’t presented recently, think of a conversation you had when you were engaged, confident and positive and felt a really strong connection with the other person. By implanting that memory in your brain, you can perform better under the pressure of having to speak in front of others. This may sound simple, but you’d be amazed at how often we let our breathing become irregular leading up to or during a pressure situation like a presentation. Anxiety speeds up your breathing, forcing you to breathe high in your chest. By consciously slowing down your breathing and making sure you breathe from the diaphragm, you’ll be able to quickly calm yourself and reduce the social pain you’re feeling. These five brain-based strategies will give you an advantage and help you deliver a powerful presentation. If you practice these techniques, you’ll be training your brain to use them in any pressure situation where you experience that dreaded social pain. Bill Benjamin is a training and leadership expert at the Institute for Health and Human Potential and a contributor to the New York Times-bestselling book “Performing Under Pressure.” He is a highly sought-after speaker on the topics of emotional intelligence and performing under pressure and works with people in many high-pressure environments, including surgeons and members of Intel, NASA, Goldman Sachs and the U.S. Marines.